This design is purely a reflection of the influence of the Indian design concepts that I have seen people wear over and over again in various forms. The design has a very simple elegance created by the conjunction of the traditional “jhumar” look and the more modern “chandelier” look. 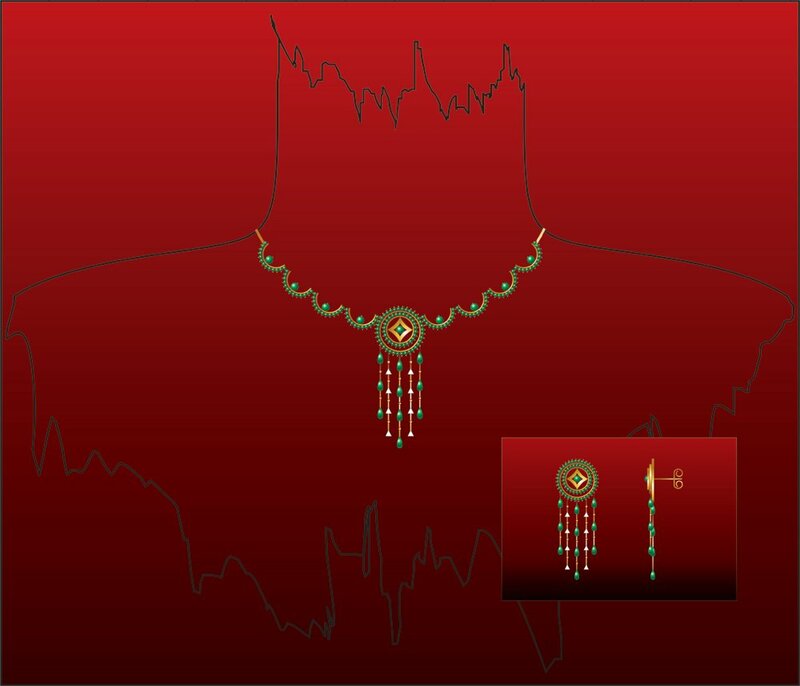 Emerald being recognized as “The royal stone” from the ages of kings and princes is of prime importance in this design. The necklace is assembled with a simple horizontal link which creates very basic but sturdy flexibility for it to fall comfortably in place around the neck. As you may notice the amount of gold showing around the stones is kept very minimal, you may question the strength of this product. To work on this part, I have made sure that the depth of the gold is a minimum of 0.5 mm which is sufficient to support this design. The stones are all pierced with the gold knots well rounded to avoid catching fabric and of course give a well finished look. The earring can be worn as a stud alone or along with the hanging emerald chain component which gives it a more elaborate look. Even though I would normally recommend a round snake chain for this design, it can completely vary with the personal choice of the wearer. This design is completely molded in 18K yellow Gold. Fine quality emerald beads (full as well as half drilled) and gold beads are used. Emerald, depending on the richness of its “slightly bluish green” color looks best when set against yellow colored metal. At most a few accents of white gold created by rhodium can give a simple shade or twist in the simplicity of the design if used cleverly. When a fairly good quality emerald is set entirely in white gold, it starts to look paler. However if the color of emerald is extremely dark, it is better to set it open from the back so as to let the light pass and show forth its color. The depth of the setting metal in this case should be kept minimal so as to allow the passage of light through the stone. Almost all emeralds have fissures or cracks in them naturally. For this reason they are “oiled” (“joban ka tel” as we call in casually in India) which is a temporary treatment of the stones. To learn more about the treatment and care of your emeralds click here. Are you considering using alternate metal or stone options? Some of the other options you can consider for this design in metal can be copper, gold plated Silver or several other not-so-precious metals such as alloys of other metals. Any of the above mentioned metals can be polished or plated with a yellow metal (may or may not be gold) if desired. A lower or higher karatage of gold can also be used for the same design. Click here to read more. Emeralds can be replaced by synthetic emeralds or other green colored stones such as tourmaline, or tsavorite garnets etc. If you want to see this design enriched by another color say blue, pink, red, etc click on the individual colors to see the change and its impact on the design. Some of the other options you can consider for this design in metal can be Silver, Platinum or several other not-so-precious metals such as Stainless steel, Titanium etc. Any of the above mentioned metals can be polished or plated with a yellow metal (may or may not be gold) if desired. Click here to read more. Diamonds can be replaced by "diamond look alikes" … or can they??? You want to try using some other blue? What about another range of colors for this design lets say Ruby or emerald or aquamarine?